Relying on the defense to save them wasn't going to work either, as the elite, opportunistic defense of the first 8 weeks transformed into a decent defense at best. Then injuries started popping up on the defensive side of the ball as well. Standout defensive tackle Henry Melton went down, and Brian Urlacher ended up missing the last quarter of the season. The turnovers and defensive/special teams touchdowns ran dry, and the Bears lost to teams like Seattle and Minnesota, both of which ended up taking the Bears' wild card playoff spot(s). I hate to say it, but I fear that this year might have been the closing of the window for the Bears. The explosiveness of the 2006 teams has long since faded away, and established players just aren't as young or effective as they used to be. This is no more apparent than with Brian Urlacher and Devin Hester. Will Brian Urlacher be back? Urlacher has been one of my favorite players for almost as long as I've been watching football, so it is sad for me to say that I just don't know if he'll be playing next year. He came into the season with a knee injury that kept him out of the pre-season, and ended the season sitting on the bench with another injury. In the meantime, he just didn't play with the same speed and energy that we are accustomed to. There were a few bright spots, but it's apparent that he's lost a step or two. He just isn't capable of running downfield with receivers anymore, putting more pressure on the safeties in the Cover 2 scheme; and he's not able to cover the field from sideline to sideline anymore, giving outside runners and scrambling quarterbacks more freedom than they should be allowed. I want to see Brian stay with the Bears, and I want to see him win a SuperBowl with the Bears, but it's hard to ignore the drop in production from him, and the persistence of injuries. Regardless of whether he comes back or not, the Bears need to start looking for a long-term replacement for him in the draft. Devin Hester is another one of my favorite players in the league. I think almost every sports fan has that one player who made them excited to watch the sport. That one player that they tuned in to watch. For me, that player is Devin Hester. Before 2006, I only peripherally followed football. My dad and I went to UNLV home games, I played Madden on my PS2, I wore Bears shirts, and I'd watch a Bears game or Monday night game if I didn't have something better to do. But then I started seeing this kid, Devin Hester, returning kicks. He was magic. Everytime he touched the ball, it put me on the edge of my seat. He single-handedly changed games, and validated the necessity of special teams play in football. Having the opportunity to see him return kicks made me want to watch Bears games. It stopped being an "if I'm not doing anything else" activity. If the Bears were on, I cleared my schedule for those three hours. Just before the SuperBowl against the Colts was about to begin, my dad got up to go to the bathroom or something, and I joked "Don't do it! You'll miss Devin Hester return the opening kickoff for a touchdown!" My dad laughed but left the room anyway. And then Hester returned the kick for a touchdown. He was that kind of player. Teams just don't fear Hester the way they used to. Sadly, the Devin Hester that I loved in 2006 isn't around anymore. Hester still returns kicks, and the commentators still talk about how he is a game-changer and that the punter needs to be careful about kicking to him. But his production has gone down too. He just doesn't have that hole-hitting speed and acceleration that he had six years ago. He plays it too safe, walking out of bounds instead of cutting back to go for broke. I don't even remember off-hand the last time he returned a kick for a touchdown. In fact, last year, when Johnny Knox started taking over punt return duties for Hester, I though his days in Chicago might be over. But Knox got hurt, and Hester kept his job, and now I'm not even sure if Knox will ever play (I hope he does). The bottom line is that it is getting very hard to justify keeping Devin Hester on the 53-man roster. He just hasn't made any significant difference on special teams for several years now, and he hasn't done jack squat as a receiver. But Hester and Urlacher aren't the only players whose best days seem to be behind them. Lance Briggs isn't as young as he used to be, Julius Peppers was a veteran when he started in Chicago, and Charles Tillman has quite a few miles on him too (although that didn't stop Tillman from having a career year). These guys are all playing at high levels, but I can't help but wonder how much longer they have left. Will 2013 be a rebuilding year? should he focus on finding top-tier offensive linemen to keep Cutler on his feet and open holes for Matt Forte? Or should he start trying to find the heir apparents for Urlacher, Briggs, and Tillman? I just don't see Blake Costanzo or Nick Roach being able to fill Urlacher's shoes long term. Emery is going to have some very tough decisions to make this year. First and foremost will be whether or not to keep the current coaching staff. Smith's staff has been great at keeping the defense playing at a high level (especially when it comes to forcing turnovers), but they just can't seem to get the job done offensively. Maybe Smith isn't cut out to be a head coach? Maybe he should go back to being defensive coordinator? Or maybe Emery should throw the whole lot out and bring in some new talent? 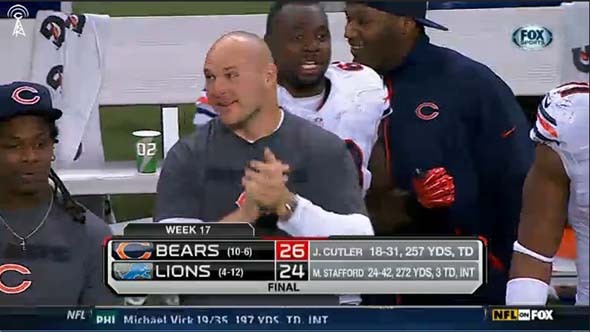 In addition to that, he'll have to decide whether Cutler, Urlacher, Melton, and other players are worth resigning. The idea of Brian Urlacher wearing anything but a Bears uniform makes my stomach churn, but I don't know that Emery can justify paying him the money that he will need in order to stay in Chicago. I guess when it all comes down to it, I can't help but wonder: will the 2013 Chicago Bears be the same Chicago Bears that I've been rooting for all these years? Don't neglect the offensive line any more! The bottom line is that the Bears didn't do anything last off-season to address the biggest issue on the team: the offensive line. They can't make that mistake again. I wouldn't be surprised to see the Bears use 2 or 3 of their early draft picks to go after offensive linemen. This might be good news for Brian Urlacher and Henry Melton, since doing so may force the team to neglect looking for more depth on defense. Last year, I felt confident that the Bears could focus their attention on rebuilding the offense, since I had faith that the defense would remain solid. For the most part, the defense did hold up. But aside from Brandon Marshall, the offense didn't really get any better, and now I'm not so sure about how well the defense will hold up. Even if the Bears do get some quality offensive players (some linemen and maybe a tight end), it might still be years before the offense clicks. In the meantime, they might end up suffering from a defensive collapse that will keep them out of the playoffs next year and down the road. The window might have closed on this team.